10% off Fabric & 15% off Linings when your order 10 metres or more. 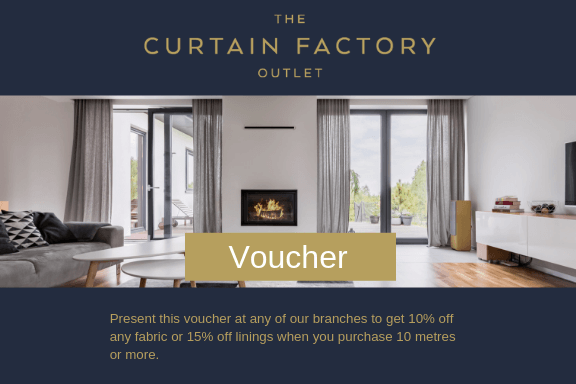 Throughout April we are offering you 10% off all fabric orders of 10 metres or more & 15% off when you buy 10 metres or more of lining material. The offers are valid on full price, sale and clearance lines both on-line & in-store. Orders that include 10 metres or more of fabric AND lining will qualify for both offers. To get your 10% & 15% off online or in-store, follow the instructions below. There is no need for a voucher or code - the 10% & 15% discounts will automatically applied during checkout. You can get 10% off all fabric orders and/or 15% off 10 metres or more of lining material. To get the discount, follow the instructions below. 1. Download the voucher (click image below to open PDF voucher). 2.When you reach the checkout in-store, either show the voucher on your phone or hand us a printed copy. Note: Voucher Valid from 10 April 2019 - 30 April 2019.